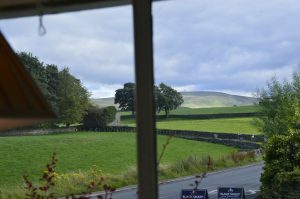 The George and Dragon Inn is a 17th-century coaching inn located in the picturesque Yorkshire Dales National Park, UK. After nearly a 24 hour 5000+ mile journey, it welcomed me for a much-needed rest. 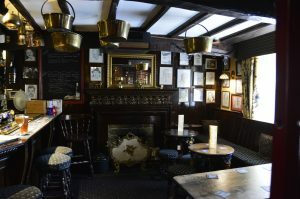 You never know what to expect when stepping inside a historic pub, but the George and Dragon is a fabulous find. Visiting here is a visit of history. Narrow country roads make you slow down and enjoy the views. And the views are spectacular. has been greeting travelers for over 300 years. 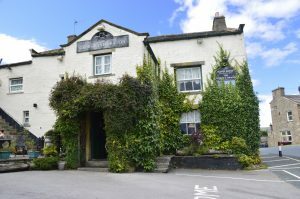 Called a coaching inn, it was a place the carriages stopped to give weary travelers a break. Friendly, casual, welcoming. When you step inside you step back in history. Rich dark woods, brass, vintage decor in a classic Dales pub style. Eclectic collections adorn the walls. Fun. Step back in time and slow down. bed was super comfy. The building may be old, but the amenities are modern. Complete with wi-fi. All rooms are en-suite! The food in the Black Sheep Pub was delightful. From classics like fish and chips or meat pies to gourmet pub food, choices are diverse. Don’t forget to try a local brew. Guests are also treated to great breakfast options. Start with the cereal bar then pick your customized hot breakfast from a part or full English and more. There is a car park on the hotel property. If you are campers, there is a camping area nearby. Hikers were stopping past the pub for a brew on their way back home. It’s a central location for exploring the area. 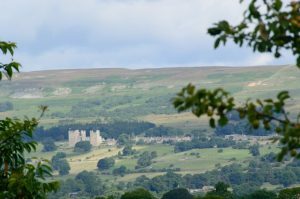 Bolton Castle, Aysgarth Falls. Lots of spectacular scenery. Great hiking. Shopping. If the landscape looks familiar it’s been in the movies. Both Robin Hood Prince of Thieves and All Creatures Great and Small were set here. Nearby, you can find the building that still bears the Harriott name. Not sure what to see? Just ask, they will be happy to make recommendations based on your interests.